At Inner Fire, the year-long therapeutic and practical work-based program creates a foundation for deep healing. While gently tapering off psychotropic medications, engaging in this program helps to strengthen and rebalance the striving individual on a deeper soul/spiritual level, where traumas and wounds are stored. This is not an easy process – nor is it a process “done-to” the seeker. Lasting change must be desired by, and come from, each “seeker.” Their own “inner fire” is the transformative energy that can effect such change. Through their experience, insight and love, therapists and guides at Inner Fire support and accompany the seeker in their transformational quest. The Inner Fire program engages the whole human being: body, soul and spirit. Our experience is that the soul intimately and directly informs and affects the brain. Instead of working from the intellect with the primary emphasis on talk therapies, the artistic therapies work from the “inside out,” addressing “soul health” as a way to bring harmony and balance on the deepest levels, combining this with cognitive therapies that help reframe intellectual and mental constructs. We do not use labels to describe the seekers. Being a human being is simply complicated. Challenges and episodic struggles which so many of us wrestle with during our lives are appreciated as simply an aspect of the journey of being human. The Inner Fire program aims to meet all aspects of the striving, human being. So many of us have old patterns which rule our self-esteem and actions. Our proactive therapies and practical work, gently stretch the seeker beyond his/her comfort zone, which too often is unconsciously controlled by fear and anxiety, into new territory from which they can truly grow and blossom. By reinforcing these new patterns over the course of a year, deep healing can be achieved. “Psychosis” is sometimes seen as being “stuck in one’s head,” and thus an individual is not able to engage as a whole human being. “How do I get out of my head? !” is a typical cry of desperation. The therapies described below help to balance the relationship between the physical, soul and spiritual layers within the human being. By aligning and harmonizing these layers, the conditions for significant change and healing can occur. The artistic therapies at Inner Fire stir the soul, encouraging a deeper breathing and, by tapping untapped wells within our innermost soul, awaken dormant qualities, gifts and skills. The entire Inner Fire Program focuses on the creator within each seeker. Nothing is done at Inner Fire to “keep someone busy” or because it is “nice”. Everything has a therapeutic aspect – and the process is essential. We focus on the seekers’ strengths, which are revealed as the year progresses. Being a human being means having the ability to develop the freedom to make choices. Many people are unfree because of conditioning and fears. We can choose to believe we are more than our trauma, more than our wounds, our disappointments – and that our life challenges are simply opportunities to inwardly grow and develop into stronger and more insightful human beings. Rhythm is very important in the process of rebalancing and healing. Every seeker receives their own unique schedule in which there is a balance between the empowering, practical, group work in the bio-dynamic garden, kitchen, forest or housekeeping and the one-on-one artistic therapies. Each evening draws the seekers together again to share in appreciation, drumming, reading a biography, singing and discussing questions. Occasionally, guests with inspiring life experiences are invited for supper and an evening of sharing. During the weekends, the seekers hike, swim, explore in nature and share in various ways: storytelling, games, yoga, weight-lifting, etc. Creative workshops pepper the year, offering the opportunity to make felt slippers, learn blacksmithing, carve wooden spoons, practice non-violent communication skills, canoe, or dare to step into one’s vulnerability through clowning. The structure of the Inner Fire program is built on the concept that “out of form, comes freedom”. Because rhythm is essential in the healing process, the foundational work of healing is built within daily, weekly, monthly and yearly rhythms and activities. With a firm regard for the individual, and where they are on their life path, we offer a 3-Phase Program to support each Seeker in unfolding their unique healing journey. The three phases of the Inner Fire program are: The Foundation, Transformation, and Transition to Independence. The first phase is The Foundation, and is structured to lay the groundwork for healing. The second stage, Transformation, constitutes the bulk of the program and is the central time of healing work. The final stage, Transition to Independence, prepares the Seeker for life after Inner Fire. There is no set time frame for these three phases; they are determined by the Seeker’s progress and the choices they make. The Foundation This is a time of arrival and becoming accustomed to the Inner Fire lifestyle. It involves adjusting to the diet, the rhythms of the days and weeks, the community, and the variety of activities. Because we are so easily drawn into old patterns and thereby distracted from ourselves and our healing process, it is a time of no visits or contact with family or friends. This is an opportunity for the individual to begin to meet themselves with a new perspective, to change unhelpful self-images, and to discover and develop new abilities, qualities and healthy habits. It is also a time of getting to know each other and the level of support needed. There are no solo activities or walking alone. The Foundation phase aims to establish a foundation to support the deep healing work which follows. Tapering from medications usually begins during this time. Seekers begin their monthly meetings with our Psychiatrist and together, with input from the Program Director, determine an appropriate tapering plan. When the seeker has settled in and is able to actively and consistently engage in the variety of activities offered, they are ready for Phase II. Self-confidence has grown, an awareness of the community has developed and initiative and independence is expressed. The effort to express feelings and share thoughts is encouraged as tapering begins and throughout their journey at Inner Fire. Transformation This is the central time for doing the work of transforming oneself, putting into practice what has been learned in The Foundation phase, and awakening to and changing unhelpful patterns. Typically, one is in the process of tapering with all the challenges that come with the withdrawal symptoms. Here inner confidence is growing, along with courage and enthusiasm. Awareness of the opportunities which arise out of life’s challenges can replace feelings of blame or of being a victim. The Seeker learns to claim feelings, speak out, and ask for help. This is also a time of greater independence within specific parameters and with support as needed. Communication and visits with family and friends can begin. Solo activities, such as walking alone, are possible. This is a time of taking increasing responsibility for personal activities and time management. There are some unstructured hours in the week that are open to the initiative of the Seeker. If the Seeker wishes, family therapy can begin. When a Seeker has developed sufficient independence, self-confidence and the ability to sustain a healthy basis in life, they are ready to move on to the the last phase of the Inner Fire program. Transition to Independence This is a time of preparing for life after Inner Fire. The Seeker is actively engaged in shaping their schedule. It typically includes community service, apprenticeship opportunities with local crafts or trades people, or work outside of Inner Fire. The Seeker chooses which artistic therapies to engage in, an independent project on which to work, and optional engagement in evening activities. This phase includes family counseling and a weekly meeting with our Transition Guide to develop a plan for leaving Inner Fire. Biographical Counseling aims to help people in life crisis or psychological distress to enter into dialogue with their own life story. This is fostered through narrative and artistic process and an awareness of developmental cycles and rhythms. Connection and creativity are encouraged during this objective process that kindles interest and wonder in one’s own life journey, leading to a search for meaning and identity. Biographical Counseling helps people find a new relationship to their past, awaken to opportunities in the present, and shape their future more responsibly. The biographical counselor serves as a facilitator and guide in a collaborative relationship with the client. Each person’s unfolding and unique life story is held in high regard. The kitchen at Inner Fire is the heart of all activity. Sunshine floods the kitchen with natural light, and flowering plants in terra-cotta pots and urns bask at the windows. At breakfast time, simple clay bowls, cups, plates, and colorful linens are set in anticipation for the morning feast. A beautiful thriving green vine intertwines itself in the chandelier above the table. Positive life- forces abound in the nourishing aromas. Food philosophy at Inner Fire takes its direction from the principal that we should choose food substances that are “close” to the earth. Living food is food that is fresh, organic or biodynamic, and minimally changed from its original state. In this day and age, the life forces available in supermarket foods have been severely degraded. Processing and long term refrigeration contribute to this problem. At Inner Fire, great care is taken to introduce maximum beneficial microorganisms into the gut at every meal. Kefir, fermented vegetables, and bone broths serve to proliferate healthy probiotic gut flora. The GAPS diet as developed by Dr. Natasha Campbell-McBride serves as the basic foundation for the food program at Inner Fire. The cook sources nearly all foods from local farmers and gardeners. In addition to cellular and physiological healing, nourishing foods support the human being on many other levels as well. Mealtimes provide the most basic sustaining rhythms. 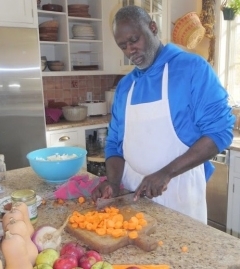 Seekers at Inner Fire regularly assist our resident cook and alchemist, Audrie Brown, with chopping and dicing a huge assortment of vibrant and colorful fruits and vegetables. In doing so, they not only build knowledge for a lifetime of healthy eating, but they also develop an artistic relationship with the earth itself. With great love and conscientiousness, the physical substance of food is transformed into a dynamic life force, which is then available to each individual seeker as the nutritional foundation for their healing journey. For someone who struggles with the challenges of being human, the stream of life can seem elusive and out of reach. Engaging with the dramatic tools of movement, language, speech, and improvisation, a person participates in, and taps the life of, the forces around them. This brings energy, an awareness of these forces, and an empowering sense of what a group of people can create together. It teaches empathy, understanding, cooperation, the objectivity of the creative forces that shape our lives, and how we can make ourselves available to something larger than ourselves. The activities re-awaken the stream of a person’s own life forces. Essentially, the work is about understanding: what does it take to be truly alive in ourselves and engaged in a vibrant conversation with life? The tools of drama give us an understanding for this. Hauschka artistic therapy helps to build inner soul substance while indirectly digesting traumas and challenges of life. This approach to artistic therapy is predicated on the understanding that healing is the process of tapping untapped wells within our innermost self. There is a dynamic relationship between a particular way of working artistically and soul “breathing” and health. Growing to recognize the interrelationship of our own soul breathing with that of nature around us is a reuniting and healing experience. Through watercolor painting and discovering the colored moods of nature and how the soul breath is reflected in the seasons and in the unfold¬ing of a day from sunrise through sunset, wonder, love and joy are kindled. The soul is nourished through the beauty of the luminous colors, and the living element of water can help us, when we feel stuck, to dare to breathe out, to let go. Trauma can lead to the experience of abandoning the physical body, of not daring to stay connected to one’s ‘house of pain’. 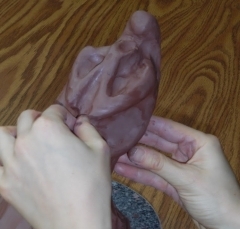 Gradually creating a particular form in clay calls for centering, a depth of concentration and imagination during which our breathing deepens. Through the black and white dynamic-stroke drawing, an inner rhythm is established, which can harmonize our breathing. Sensitivity for the qualities of the light and the dark and all that lives between these poles helps to develop and awaken an appreciation for the subtle nuances of life. Such opportunities for soul-engagement strengthen our life forces, empowering us to embrace and work with the challenges before us. By working with watercolor, clay, pastel, form drawing or dynamic-stroke drawing in this unique way, we are making a “bee-line” to the soul, thus gradually reawakening and harmonizing that which has become silenced and out of balance. The medium is selected by the therapist who is able to assess which medium would best support the individual in their journey toward healing. Guidance is also offered, but then the individual process begins. When left to free expression alone, the illness may simply be perpetuated and forward movement inhibited. The Soul is nourished through the building up and balancing artistic process. Therefore, it is this process and not the end result that counts. One need have no previous artistic experience. The role of the Hauschka artistic therapist is to guide, to facilitate. The individual, through his/her own will, takes up the challenge and a process begins. He/she is never in the position to say, “You have healed me.” One has healed oneself through one’s engagement in one’s own artistic process. The benefits of sauna and heat therapy are almost too numerous to list. Throughout history physicians in all cultures have recognized and advocated sweat baths for increased health and vitality. Read more.. The benefits of sauna and heat therapy are almost too numerous to list. Throughout history physicians in all cultures have recognized and advocated sweat baths for increased health and vitality. Infrared sauna therapy is one of the most effective ways to approach the problem of detoxification from exposure to modern chemicals, pesticides, heavy metals, psychotropic medications, or other drugs. No matter how careful we are, throughout our lives we are exposed to an astounding number of toxins in our environment. The liver and the kidney take the brunt of this impact, but inevitably some toxic residues make their way directly into the bloodstream and are ultimately stored in fatty tissue. Infrared heat therapy can help facilitate the gradual removal of these toxins through the vehicle of the skin. The skin, often referred to as the “third kidney”, is a remarkable detoxification organ. The mainstream medical community increasingly recognizes sauna therapy for detoxification and it is used extensively for veterans recovering from severe chemical exposure. At Inner Fire, seekers utilize infrared sauna on a regular basis to assist with detoxification from medications and/or drugs. Two to three times a week each seeker exercises lightly for half an hour or more and then drinks a glass of elderflower tea (a gentle diuretic). They then use a small wooden infrared sauna at approximately 150F or 66C for 20 to 30 minutes. After the sweat bath an oral supplement of charcoal or bentonite clay is given in order to bind any internal toxins so they can be more readily eliminated. To complete the treatment seekers take a brief shower and then apply rosemary-infused massage oil. In addition to the obvious medical benefits, warmth therapy can assist an individual with soul imbalances. Fever or heat has a supportive effect on the self or “I force” of the human being. Fire and heat have always been connected with transformation and rebirth. No matter how difficult our life experiences, we can release old negative patterns and embrace new unrestricted ones. At its best, heat therapy is a conscious striving for maximum inner warmth and strength, which aligns each seeker with their higher life intentions. The organ of the liver has been described as a critical “blood balancer.” The liver screens, filters, and neutralizes every substance that enters the human body through the digestive tract. It absorbs nourishing blood from the stomach and intestines, and adds vital nutrients such as iron to the blood. It then sends the nutrient-rich blood out to the rest of the body to support strong and healthy human functioning. The liver also secretes bile to carry away waste products, clears the blood of drugs and other harmful substances, and creates immune factors that battle bacteria. A strong liver builds strong blood, and strong blood is a primary foundation for good mental health. At Inner Fire, therapists seek to support this vital organ with yarrow compresses. This holistic plant-based therapy is a subtle but powerful healing tool frequently used in anthroposophical medicine. Three consecutive days a week, after the midday meal, seekers retire to their rooms and rest with a warm liver compress. Therapists prepare a strong yarrow tea by pouring boiling water over the flowers and leaves of the plant. They soak cotton cloths in the decoction and the compress is wrung out and placed directly on the skin over the liver. Flannel and wool blankets are carefully wrapped around the torso like a cocoon and a water bottle is placed above the area. After 15 minutes the compress is removed but the cocoon is left in place while the seeker continues to rest. According to western and eastern herbal traditions, the yarrow plant harmonizes and balances yin and yang bodily energies. Yarrow calms the nervous system, mediates highs and lows, internal and external, and helps reconcile opposing forces. The yarrow plant prevents extreme conditions of exuberance or depression in our lives. Ancient Chinese wisdom valued the yarrow flower above gold because of its profound stabilizing power. Regularly applying a compress of this substance to the liver strengthens all systems of the body, and is particularly supportive during detoxification processes. The foundation for our work with music as a healing modality is the view that each human being consists of body, soul and spirit. The elements of rhythm, melody and harmony are musical expressions of our human nature. Each of these elements is used in the therapeutic setting to support the individual, with the help of listening exercises, singing, instrumental play and movement. Through an experience of musical “fine tuning” of the organism, a greater sense of harmony and balance can be achieved. Working with rhythmic elements invites a stronger cultivation of presence and intention, and encourages the self to direct its impulses with determination and purpose. Working in the realm of melody supports the healthy integration of thoughts, ideas, and imagination, by opening pathways to express in musical form what lives in the soul and mind. Working with harmony addresses the realm of breathing, both literally and figuratively. Contraction and expansion exercises on a stringed instrument, such as the lyre, serve to find a balance between these two gestures that define our relationship to the world around us. While we use wind, string and percussion instruments for therapeutic purposes, working with the voice, the most personal instrument we each have been given, is a central part of the work. Our voice expresses a very essential part of who we are. Particular exercises have been developed that serve to free the voice. Connected with these are exercises that deepen the listening capacity and thereby strengthen the connection with the core of our being which, in the stimulating environment in which we live today, can get so easily lost. Finally, in making music together, be it singing or playing, improvisation or working together on a given piece of music, a sense of community arises that can be deeply healing and comforting. Singing and breathing together is an activity that transcends limitations and creates a bond within the group that is fulfilling, strengthening, vitalizing and healing in the deepest sense. How can Rhythmical Massage Therapy be helpful for individuals who have suffered abuse and trauma, struggled with addiction, and/or have mental/soul health challenges? Rhythmical Massage Therapy, as developed by Dr. Ita Wegman, aims to enliven and restore equilibrium to systems in the physical as well as the soul/spiritual organism. The life-supporting forces of warmth, rhythm and breathing form the ground from which the therapist seeks to address the human being in health and illness. One can picture the body as a living organism expressed in muscle and tissue, with the solid, fluid, airy and warmth elements interpenetrating one another in a musical harmony. In addressing the situation of individuals who have suffered abuse and trauma or who struggle with addiction or mental/soul health challenges, one must bear in mind that this is a complex topic, and only broad indications of the potential role of rhythmical massage can be given here. The massage is very individualized when applied in specific situations, but generally can be viewed as a comforting, gentle, supportive therapy. A significant effect is that these individuals, who may crave yet avoid human touch, can over time tolerate it and find it very healing. Trauma, fear and stress can strongly disrupt the intricate life rhythms in human beings. The senses may be over-stimulated, resulting in a ‘frayed’ nervous system, as may be seen in overworked kidney and adrenal functioning, and as may be accompanied by depleted liver and life forces. Rhythmical Massage Therapy can be an instrument for supporting and encouraging the return of healthy life rhythms and life processes, accompanied by an overall strengthening effect and a sense of coming back to well-being. Specific and deeply calming massage movements can effectively address these individuals, helping them over time to be able to relax and find their center. By applying treatments specific to the kidney/adrenals and liver, depleted forces may be restored. Improved sleep and digestion are often reported after a series of Rhythmical Massage Therapy treatments. Through the rhythmical massage movements of binding and releasing, tightness in breathing or in the muscle tissue can be relieved. Other movements assist in grounding, helping individuals come into their legs and feet. In situations of addiction, which typically lead to the loss of one’s center, this type of massage therapy can be particularly healing. By stimulating the warmth and fire of the healthy will, rhythmical massage therapy can support and encourage the human ‘I’ to become engaged again, thereby allowing the individual to reclaim his/her center. In some depressions, the therapist may work in such a way as to aid in overcoming a kind of sluggishness in body and soul. Individuals with mental/soul health challenges may also benefit from experiencing the boundaries of their body. Another intrinsic aspect of rhythmical massage therapy is the use of particular healing, organic substances: oils, ointments, and compresses, which are specifically chosen to enhance the therapeutic efficacy for each individual. Spacial Dynamics is the name given in 1985 to a body of exercises, games, movement analysis, evaluation, and enhancement developed by Jaimen McMillan. It is a movement discipline that explores the various ways that human beings relate to the surrounding space, and fosters awareness of individual movement patterns in order to discover healthier ways of moving and relating. Spacial Dynamics offers effective ways of using our physical bodies in all of our daily actions. By providing an enhanced experience of responding to the environment and to other people, Spacial Dynamics promotes self-confidence. These new movement experiences can result in positive self-regard and generate enthusiasm for one’s work and play. This can be a crucial component in overcoming addictive behaviors and achieving a greater sense of balance in one’s life. The expansion of one’s movement repertoire often leads to broader viewpoints, thus revealing alternate ways of interacting with others. Greater understanding about individual tendencies allows one to consciously make changes in the way one relates to the world. The benefits of ongoing Spacial Dynamics sessions are manifold. Through expanding and enhancing his/her experience of space, the individual very often feels greater self-control as well as deeper connections with others. Increased perception results from these exercises, which in turn enables participants to feel more comfortable in their own body. Such discovery of ease in movement builds self-esteem and greater comfort with interpersonal connection. This lays the foundation for building the strength to overcome addictions and forge new paths. Increasing competence with the exercises fosters a sense of mastery that translates into other areas of life. No longer locked into a particular way of being, the individual finds alternate, viable options for being in the world. The goal of Spacial Dynamics is to support integrated movement that addresses the whole human being within the spatial context. Specific components of Spacial Dynamic sessions include group games, activities in pairs, and slow movement exercises taught in various settings. These are offered in an environment in which each person is recognized for his/her gifts and challenges. In an atmosphere of safety within the group, such activities can lead to self- reflection and community building. The earth is always giving, changing and rich with compassionate energy. Just being in the forest can be healing. 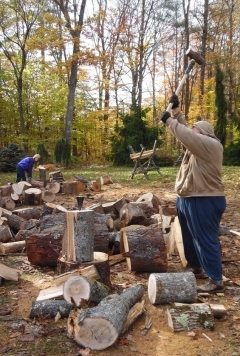 Building trails, cutting and splitting cord wood, making dams and bridges are examples of the projects offered. This is a way for seekers to create opportunities for others to access the forest, to push deeper into newness. Workings in nature seekers have an opportunity to test their surroundings. Which trees can you use for fire by friction, which trees can you brush your teeth with, which tree provides the most BTU for home heating, which tree back is good for making cordage. On a given day seekers with be working on a project for the good of the whole community. Shift gears to a sit spot, this is an activity in which you go to the same spot every week through the year and sit still and silent. Sit spots have shown that wilderness can gradual feel like home. There are also opportunities for seekers to craft tools, baskets, string, all from natural material. The forest work at inner fire allows the rich loving energy’s all around us all the time, to encourage healing while build for the community. Therapeutic Eurythmy is a movement/art therapy established in European clinics and hospitals where anthroposophical medicine is practiced. As illness can be seen as an opportunity for transformation, this is one of the many therapies offered at Inner Fire in which seekers take an active step in transforming their conditions. Therapeutic Eurythmy offers healing support through movements that help adjust and align people’s relationships to themselves and the world. After a thorough medical diagnosis has been reached by the referring physician, specific movements are prescribed to address the physical, emotional and spiritual being. When the patient and therapist meet, a sequence of movements are rhythmically practiced together in a session that typically lasts 30 to 60 minutes. 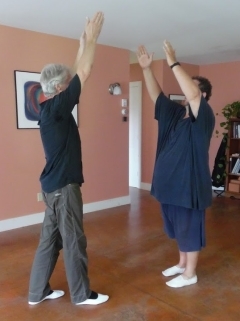 Through a series of such sessions, a home practice for the patient is created. The arrhythmic, ingrained patterns of life, nutrition, posture and inner attitudes which have cultivated the imbalance are thereby challenged and reformed by the medium of life-habits: movement itself. In this way, Therapeutic Eurythmy enables the person to participate consciously and actively in establishing balance and health in life. Most forms of physical disease, emotional distress, and mental illness are believed to be treatable with this modality. It can be particularly useful before and after surgery, encouraging the healing and recuperative process. The way we appreciate and care for our environment is a reflection of how we care and respect ourselves. To carve time amidst the bustle of living to connect personally with our home environment – bedroom, bath, kitchen and meeting rooms – which provide shelter and comfort, is an important dimension of the practical work at Inner Fire. Many people feel disconnected from their physical environment. Learning to observe and look, to reach into the crannies and penetrate the abandoned corners is to engage in our will and heighten our consciousness. The sense of belonging, making a difference and nurturing helps the seeker to connect personally with the physical spaces. All cleansers used at Inner Fire are biodegradable and safe for the environment and users. The art of the spoken word (a.k.a. ‘speech formation’ or ‘creative speech’) finds a range of application in educational, therapeutic and performing endeavors. Its therapeutic application, Anthroposophic Therapeutic Speech (ATS), is an artistic therapy in which the spoken word is explored and practiced. 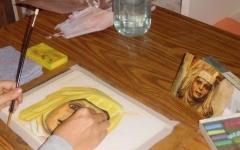 As with other artistic therapies, the client’s own activity is stimulated, awakening motivation and thereby augmenting the resources for healing. These renewing forces affect physiologic, psychological and spiritual processes, and allow us to come more fully to ourselves and take hold of our lives in new ways. Following a diagnosis based on voice, breathing, posture/movement, articulation, etc., therapeutic speech works with vowels and consonants, breath, rhythms, voice placement, and imagination, as well as with stories and other prose texts, different styles of poetry, dramatic dialogue, speech/language exercises, and the integration of movement and gesture. Therapeutic speech can contribute to meeting the challenges of developmental disorders, constitutional issues, children’s learning disabilities and behavioral problems, attention problems, exhaustion, anemia, respiratory disorders, sinusitis, eating disorders, heart and circulatory disorders, rheumatic disorders, depression, thyroid dysfunction, tinnitus, speech and voice disorders, developmental delays, etc. It can strengthen confidence, cultivate a healthy sense of self, and be of help in managing stress, furthering concentration, imagination, and speaking and listening skills. Greater presence of mind and wholeness of expression can be a substantial support to individuals dealing with long-term challenges of various kinds. A new access to the experience of self is made possible, bringing renewed inner orientation in life and in connecting with others.